New complete rebuild kit for Kawasaki KX 25 0 , Each kit contains everything you need to complete your rebuild the right way, the first time- crankshaft and connecting rod (fully assembled), 66.34mm piston, crankshaft bearings, and complete gasket & seal kit made to meet or exceed OEM. Factory assembled and trued to within. 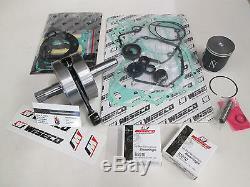 The item "KAWASAKI KX 250 ENGINE REBUILD KIT CRANKSHAFT, NAMURA PISTON, GASKETS 1992-2001" is in sale since Thursday, September 19, 2013.